Some tips will make your everyday life a little easier, some will come in handy every once in a while, and some are good for filling the "gee whiz" file. Here are 6 tricks I hope will come in handy in your kitchen. And if they never do, well, gee whiz! Pistachios are way too expensive to waste. 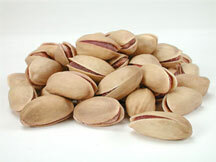 Yet many of the delicious roasted nuts arrived in shells with little to no opening. Rather than breaking your teeth or nails on the stubborn little things, next time try this foolproof method for opening stubborn shells: Take one half of a shell, stick it into even the littlest opening of an unopened pistachio, and turn the shell half like a key. The pistachio will pop right open! 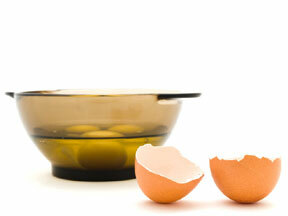 It happens to all of us: You crack open an egg and a tiny piece of its shell falls into the bowl along with the raw egg. If you've tried to get it out with your finger or a spoon, you how it slips and slides away. Next time, wet your finger with water before attempting to fish it out. You'll be shocked at how easily it can be grabbed and eliminated. Also, shell attracts shell so hold another little piece in and it will attract the piece you are trying to nab! 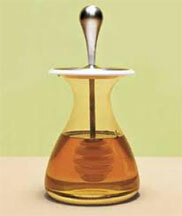 I hate when I reach for the honey and find a bottle that's hardened and crystallized. It can easily be brought back to its old, easy-to-pour glory if you let it sit for 15 minutes in boiling water that has cooled for five minutes. As it sits in the cupboard, brown sugar looses moisture. To soften it, you just need to add some moisture back in to it. Try placing a few apple slices or a slice of bread in an air-tight container with the brown sugar for a day or two. Then, remove the slices once the sugar has softened. You can also place the brown sugar in a bowl, and cover with a damp cloth and let it sit over night or place the brown sugar in the microwave, with a small container of water beside it. Microwave for one minute. Then, check and continue to microwave in 30-second increments until the sugar is soft. Dingy and stained, just isn't cool To get stains out, try sprinkling the board with salt rubbing it with lemon. For more stubborn stains, try an abrasive antibacterial kitchen cleaner and scouring pad. For the toughest, reach for sandpaper! And of course wash thoroughly afterward. Fruit is too expensive to waste but we all have those days that we see the speckles starting on the bananas or see our strawberries in the fridge getting a little "mooshy gooshy" as my daughter would say. Don't waste your money! 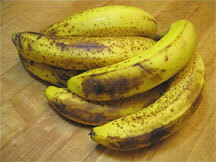 The minute you see that fruit starting to over-ripen, wash it, peel it, and freeze it! It will be ready for smoothies and/or banana bread.